We [This American Life crew] spent eight months and did over a hundred interviews to try to bypass the usual rhetoric and get to the bottom of what really happened when undocumented workers showed up in one Alabama town. 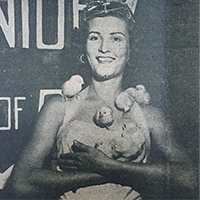 Pictured: Albertville “Miss Chick” 1954. This entry was posted in Mythbusters. Bookmark the permalink.